During the month of October, Focusers all over the world will be showing a video of Eugene Gendlin, PhD, talking about why therapy works when it works. His Philosophy of the Implicit validates the experience of helping professionals and goes beyond traditional theories to open up a world of new possibilities. The video showing will be interspersed with interactive breaks in which you can integrate what you are hearing by asking questions or sharing your own experience. Discussion will be facilitated by Beatrice Blake and other professionals with decades of experience in the practice of Focusing, developed by Gendlin. Dr. Eugene Gendlin has received the American Psychological Association’s highest award for Distinguished Theoretical and Philosophical Contributions to Psychology. In 2008 he was awarded Vienna’s Viktor Frankl prize. He was editor for many years of the APA’s Clinical Division Journal, Psychotherapy: Theory, Research and Practice. His book, Focusing, has sold over 500,000 copies and is translated into 17 languages. 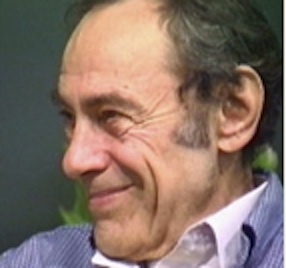 His other books include, Let Your Body Interpret Your Dreams, and Focusing-Oriented Psychotherapy. The state of Vermont Office of Professional Regulation will award 2.5 CEUs for Psychologists and Mental Health Counselors who attend the October 8 event. A follow-up weekend workshop in Focusing will be given November 2 and 3 for 11 CEUs. Please contact Beatrice for more information. The video showing is a fundraiser for The Focusing Institute. A donation of $25 is suggested. $10 for students. http://possibility-space.com/wp-content/uploads/2016/09/possibility-space-logo.png 0 0 possibilityspace http://possibility-space.com/wp-content/uploads/2016/09/possibility-space-logo.png possibilityspace2013-09-25 16:17:232013-09-25 16:17:23Gendlin video at Marlboro Grad Center, Brattleboro, Tuesday, October 8, 7 p.m.
http://possibility-space.com/wp-content/uploads/2016/09/possibility-space-logo.png 0 0 possibilityspace http://possibility-space.com/wp-content/uploads/2016/09/possibility-space-logo.png possibilityspace2013-09-18 00:26:462013-09-18 00:26:46Why do Focusing? Focusing and Nonviolent Communication are inter-related. NVC brings the awareness of beautiful human needs and how naming and blaming divert us from expressing what we need. Then Focusing can give us insight into ways that we can fulfill that need. The bodily felt sense that is at the center of Focusing practice, shows us what our needs are, if we learn how to pay attention in a kind and gentle way. Giraffe language teaches us to look for feelings and needs instead of judging, analyzing, diagnosing, giving advice, etc. Focusing teaches how to listen beyond concepts and theories, to what is real inside us. In the Netherlands and the UK, I shared simple NVC games that we use in El Salvador to teach Listening, self empathy, implicit intricacy (the many-faceted nature of the bodily felt sense of a situation), resonating between words and the felt sense, and that the Focuser is the one who knows what he or she is feeling. Participants felt that these games were helpful for themselves and in their work. Many thanks to Harriet Teeuw of Nijeholtpade, Friesland; to Erna de Bruijn and Christine Langeveld of Focus Centrum Den Haag; and to Mohamed Altawil and David Harod of the Palestine Center in Hatfield, UK, for arranging these workshops for me. And thanks to Harriet and René for making it possible for Nicolas Areiza from El Salvador to attend the weeklong training in Being Seriously Playful. It was a transformative experience for all! 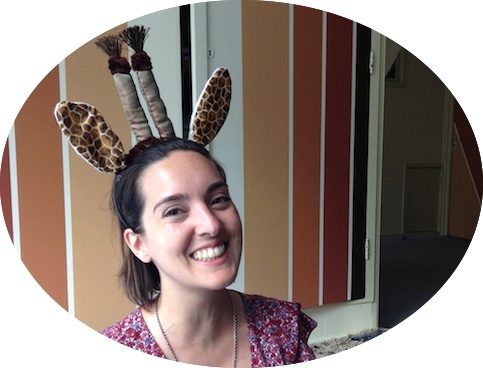 The photo is of psychologist and woman-of-the-world Branca Sa Pires of Portugal modeling the giraffe ears I made. Community Focusing workshops in the Netherlands and the UK! I’ll be leaving Monday, July 8, for three weeks in Holland and the UK! Harriet Teeuw and René Veugelers have raised money to bring a Salvadoran Focuser to their Children Focusing training, Being Seriously Playful, from July 15-21 in Friesland. The scholarship goes to Nicolás Areiza, 22, who has been working with the children of people attending Resilience Circles offered by his mother, Focusing Trainer Melba Jiménez. Nicolás has also been co-facilitating workshops for youth in San Francisco Lempa. Nicolás and I will do a workshop on Community Focusing on Saturday, July 13 from 10 to 4 at Harriet’s home near Wolvega. Nicolás will share his experiences, hopes and dreams, and we will introduce people to the fun and engaging games we use to introduce Focusing in El Salvador. Most of the games and exercises come from Marshall Rosenberg’s Nonviolent Communication. After the Children Focusing Training, NIcolás will visit friends in Germany, and I will go to The Hague to visit dear friends and supporters Erna de Bruijn and Christine Langeveld. Then I’m off to visit Community Focusing colleague Jerry Conway and his wife Pauline in Kidderminster, near Birmingham. They will show me the Real England! On Saturday, July 27, I’ll do another Community Wellness Focusing workshop for members of the Palestine Trauma Center and interested Focusers in Hatfield, north of London. I’ll be back on July 29, and ready to start private sessions in Giving Language to Stress and Thinking at the Edge. I will be gathering interested people for a beginning Focusing group in Brattleboro in August, and Evelyn Pross and I will give our fifth 5-week phone class in Giving Language to Stress, sponsored by The Focusing Institute, starting Tuesday, August 13 at 7 p.m. Eastern. Please let me know if you’d like to sign up for a class or private sessions in August or September. http://possibility-space.com/wp-content/uploads/2016/09/possibility-space-logo.png 0 0 possibilityspace http://possibility-space.com/wp-content/uploads/2016/09/possibility-space-logo.png possibilityspace2013-07-02 04:59:082013-07-02 04:59:08Community Focusing workshops in the Netherlands and the UK! The most important part of the above definition, to me, are the words “charged with the force which it is intended to represent”. In Giving Language to Stress, “charging with the force” comes with accessing different instances of stress as they are experienced in the body. We sense into situations where we short-circuited under stress, and we sense into situations that we handled in a resourced way. Holding these instances at the same time (“crossing” them) results in a widening and deepening of the bodily felt sense of what stress means for each individual. We become aware of the ways in which those positive and negative experiences are related, uncovering patterns of thought, belief and behavior that we hadn’t seen before. Seeing these patterns allows us to outgrow them. From there, it is quite easy to convert a negative statement about stress into a positive statement that is charged with meaning, representing who we are now. When the Hermetics say above: “The more exact the symbolism, the easier it is to attract the force”, I say “the more resonant the words, gestures, sounds, images, are with the bodily felt sense of the situation, the more naturally the carrying forward occurs”.